School's out and I've been enjoying every moment of summer. Last week I made ice cream on live TV. Yes really, and if you don't believe me the proof, they say is in the pudding (ok, ok, that was a bad pun)... right here. The ice cream was pretty good, and you can find the recipe for the Saffron and Rosewater Kulfi here. Now back to the mangoes. Yes, this is another mango post, but no apologies. There's probably just about one week or so, of mango season left, and I am taking full advantage of it. Every summer it feels like this blog gets a theme... two summers ago, it was ice cream, last year popsicles ruled and this year it seems to be cocktails. Jamie's original version included peach schnapps or peach brandy, but I happened to have lychee liqueur in my cupboard (don't ask!) so I used it instead. Must admit it was pretty delicious in this sangria. I used white zinfandel in this recipe. The zin was light and fruity, and a little on the dry side, which I actually quite enjoyed, as it really brought out the fragrance of the mangoes and the lychee liqueur. You could use a light rose instead, and I think it would work brilliantly too. I had a ton of mint from the garden that needed to be used up so in it went, and thanks to Jamie, I now have my second summer favourite. The sangria can be made well in advance, so its perfect for those parties where you're running around and trying to make sure everyone has a good time. Top up with club soda and you're ready to rock. Oh, and I also have something else to celebrate. As you can probably see, the website has undergone a facelift. I've got a new logo, and a pretty new header and theme. All this is the work of my fantastic friends Joe and Wendy from Stride Studio. Wendy interpreted my super vague ideas for what I wanted in terms of design and pretty much put my ideal logo on paper. It was like taking something that was not quite clear and fuzzy in my head and turning it into the perfect vision of exactly the look and style I wanted. Thank you so much Wendy. And Joe was incredibly patient with me, and all my waffling and changing my mind and waffling some more. Between them, they've turned The Tiffin Box into something truly beautiful and consistent with my vision, and I can't thank or recommend them enough. 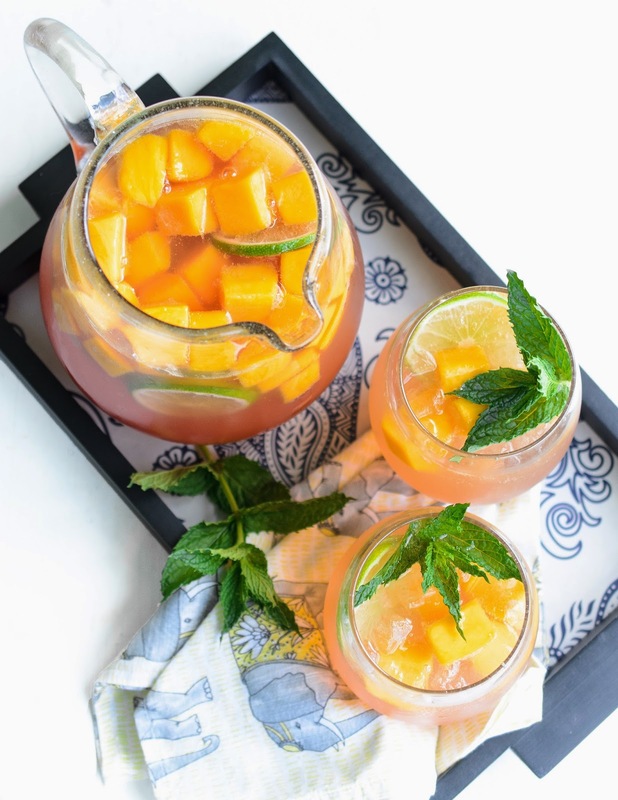 So, I raise my glass of mango sangria, and here's to a fabulous summer everyone. Stay hot, stay warm, and enjoy every minute of it. Sprinkle the chopped mango with the sugar and let it sit for 1 hour at room temperature. 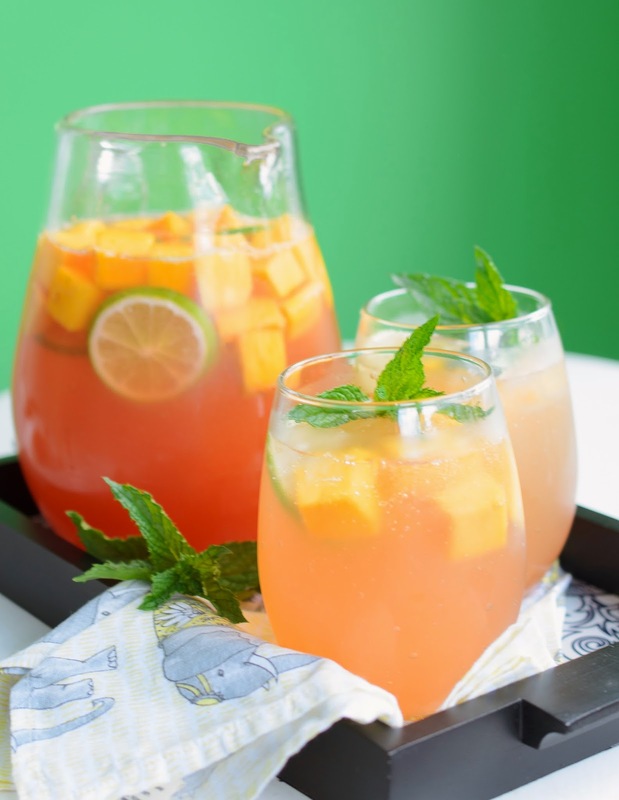 Combine the macerated mango, orange juice, lime juice, triple sec, lychee liqueur, wine and the sliced lime in a large (preferably clear) pitcher. Stir to blend. Taste and stir in more sugar if you like your sangria sweeter. Cover and chill for about an hour to let the flavours develop (or up to eight hours). To serve, pour the sangria into glasses and top with club soda to taste. Garnish with mint leaves and a slice of lime. This looks perfectly refreshing, Michelle! I also loved the TV segment on the Kulfi! I have been making ice cream and sherbet this summer ... love the idea of you rosewater and saffron take! Thanks Susan, hope you enjoy both. We certainly did. That's a fine way to spend a summer evening - kulfi and sangria. I've really got to try some lychee liqueur. It's so good to see you on TV. I now realise what's been missing from my kitchen - a TV presenter to do the mixing for me. Love the site's new look, too. 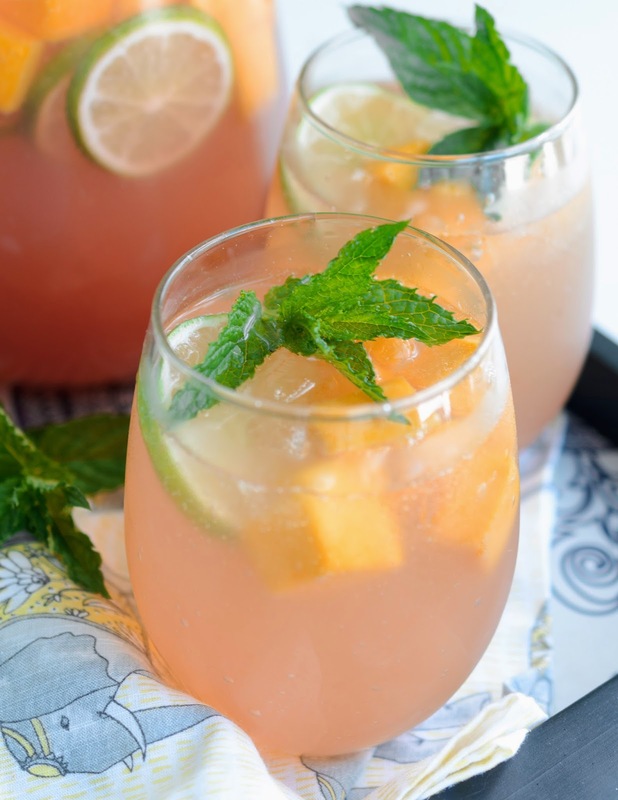 Mango AND lychee sangria? Hand me a glass asap!